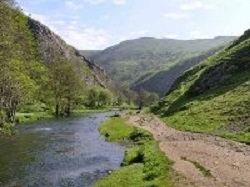 Adventure Cafe have devised this route to take in a stunning marathon distance (26 miles) circular route within the Peak District National Park. The day challenge starts in Hathersage. The route starts off by heading north and taking us through Burbage and towards the iconic Stanage Edge which forms the border between the High Peak of Derbyshire and Sheffield in South Yorkshire. The highest point here is 538m at Black Tor. An ancient Roman road guides the way on top of Stanage leading us towards the reservoirs of Ladybower and Derwent. Here we will see the grindstones and maybe even a buzz of the dam at Derwent in honour of the great dam busters! Crossing between Derwent and Ladybower we head back onto the hills and take in a few more peaks up towards Win Hill before following the River Noe back towards Hathersage and the finish of the challenge. Now it's time for celebratory drinks after a well-earned day in the Peak District! 19:30 Pre event dinner in Hathersage. 21:30: Latest arrival at evening accommodation,* check in and evening briefing ready for the challenge ahead. 08:00: Start trek challenge, this challenge is 46km and will take around 12-14 hours depending on your teams pace. It’s going to be a long day! 09:00: Breakfast and a relaxed morning in your own time before returning home after a hard earned challenge. We will be staying in clean, comfortable hotel accommodation for 2 nights. Breakfast & Bedding is provided. Please bring your own towel. 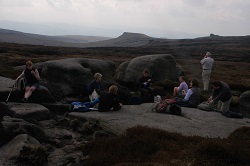 Fully Qualified, Experienced & First-Aid Trained Mountain Leader throughout the event (ratio apx. 1:10). Assistant leaders as necessary (in case of intermediate number of participants). All necessary safety equipment (to be carried by leader). By nature all activities contain an element of risk.Your leader will be first aid qualified and will carry the appropriate safety kit for the activity, such as mountain safety shelters, walking rope and from time to time mobile radios. Safety equipment carried will be appropriate to trip. The leader's primary role is to ensure your safety, but it is your responsibility to listen to their guidance and instructions. If you do not follow their instructions, and principally stay in visual contact with your leader, the leader cannot be responsible for keeping you safe. This itinerary can be run as a summer or winter event, but for either, variable weather conditions can be expected. Please pack according to the Kit List.